National Chess Day celebrations abounded this weekend in cities all across the United States--see our first round-up here. Meanwhile, the Continental Class Championships has two rounds to go and as of Monday morning, GM Alexander Shabalov is leading by a half-point. The Route 20 Chess Club in Freeport, Ill., teamed up with the Freeport Public Library, City Coffee Co. and Freeport Golden K Kiwanis Club to put on a morning-till-night National Chess Day celebration that drew more than two dozen tournament participants, plus family and friends, in this small city of only 26,000 residents. Keith Ammann (seated, left) and Gary Sargent face off in a two-minute blitz game at City Coffee Co. in Freeport, Ill. Jackie Lipford, Shawn Prue and Ryan Ekvall look on. Photo by Jennifer Marshall. While library café owner Sandi Schubert provided coffee, refreshments and lunch and artist Jennifer Marshall was on hand to paint young celebrants' faces, players faced off in a free four-round, G/30 community tournament comprising three sections: a USCF-rated sections for grades K-3, an unrated section for grades 4-8 and an unrated open section that included one high schooler and five adults. USCF member Finn Buck of Cambridge, Wis., won first place in the primary section, followed by Sam Knaup of Belvidere, Ill., and Finn's sister, Pria. The intermediate section was swept by Demetrio Velazco and brothers Bill and John Werkheiser, all of Pearl City, Ill. Matthew Coomber of Freeport won the open section; the runner-up were Roger Wedekind of Princeton, Ill., and William Wedekind of Sterling, Ill., and 11th-grader Zach Woll of Belvidere tied for third. Thanks to a $300 grant from Golden K, the Route 20 Chess Club was able to purchase an inventory of chess equipment for sale at the event. Tournament carry-all bags were the hottest item -- they were sold out before lunchtime. Route 20 club member Gary Sargent of Rockford, Ill., provided absolute-beginner chess instruction, and the library put on display more than two dozen chess books acquired specifically for the occasion. After the tournament, library visitors were treated to a free showing of the movie Searching for Bobby Fischer. 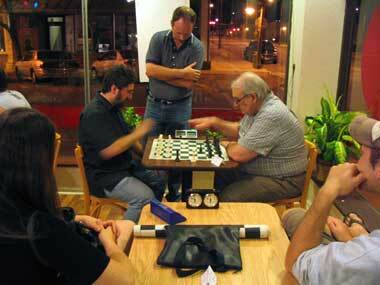 In the evening, we relocated to City Coffee Co. in Freeport for an evening G/5 speed chess tournament. Seven players, including yours truly, competed in a single round-robin . . . which I swept. As the tournament director, I considered it unseemly of me to have earned the day's only cash prize of $20 -- besides which, I had defeated second-place finisher Sargent on a technicality when, having failed to notice that his king and queen were misplaced, he played Kd1xd4 -- and so I offered him a two-minute honor match for the prize. Playing a line that transposed into a Queen's Gambit Declined, he defeated me on time with just nine seconds remaining on his own clock, in what would have been an exciting game even at a regular time control. Club member Ryan Ekvall of Freeport took third. Crosstables of the day's events are available at route20chess.blogspot.com. The Route 20 Chess Club is just over one year old, and this is the largest event we've hosted to date. To capture the momentum, it will be followed up in two weeks by our National Chess Day "Delayed Blast" rated beginners' open and open Swiss tournament, a concurrently run pair of USCF-sanctioned and rated events. Winners of trophies in the community tournament are entitled to free entry into the RBO section. The Bakersfield Chess Club hosted Bakersfield's National Chess Festival in a unique way with a "free" tournament. Instead of charging an entrance fee to play, players were given the option to bring their culinary creations to a potluck format for all to enjoy during the tournament. Twenty-two players from Northern and Southern California converged to the 4-round event with Indra Lahiri and Solomon Ruddell finishing at the top at 3.5-0.5. Best under 1600 was Steven Baker. The finale of the event was a special free simul given by IM Enrico Sevillano. He gave the option to each player to choose his or her color before the game started, but still finished the night undefeated. The BCC would like to thank IM Sevillano and the Bakersfield Event Center for making the event a success. The Jack E. Singley Academy (JESA) of the Irving Independent School District celebrated National Chess Day 2010 by holding the Scott Watson Memorial Chess Tournament. JESA's first scholastic chess tournament awarded $1000 in scholarships, numerous trophies, and a medal for every one of the 108 participants. A profile of one of the scholarship winners and photos can be found here. Full coverage of the tournament will be in the December 2010 issue of Chess Life for Kids with an article by Dr.Alexey Root (pdf). 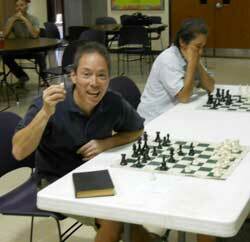 Corpus Christi, Texas celebrated National Chess Day by holding a four-round G/60 event. 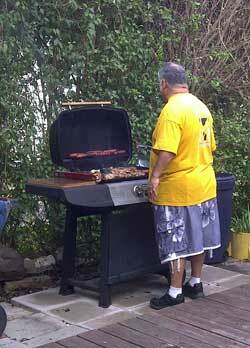 As the name BBQ II suggests the entry fee also included a delicious meal, cooked up by TD & GM* Eddie Rios to the left. There were 2 sections, 1300+ with 11 players and under 1300 with 6. Browse the crosstable and rated results on MSA. It was a memorable day for me. Not only did I win the top section, I also got my rating over 1900 for the first time. I have been trying to get an expert's rating for several years (and have been blogging on my progress), but had not had much progress until recently. I hope I can get the remaining 91 points in short order. This is the last round game against the top seed. In Marshalltown, we celebrated National Chess day with a pair of free USCF rated tournaments that attracted 30 players from a 100 mile radius. The Marshalltown Salvation Army donated the playing site and my friends at Coggin Shoes in Marietta, GA underwrote the trophy and rating expenses. The under 1400 tournament had 19 players with Daniel Carson winning with a 4.5/5.0 score. His sisters Sarah Faith and Charity Carson finished 2nd and 4th, with hometown player Chris Johnson finishing 3rd. 3 players (Betty Carson, Lee Cole, and Gail Takahashi), made the transition from chess parent to chess player in this tournaments. I've included a picture of Lee Cole (who is a magician-comedian, www.leecole.com) capturing his first ever pawn in a rated game.Lee's son Sam has been playing in tournaments for 6 years. Left:Steve Killian (U1800), Right; Bob Keating (co-champion). 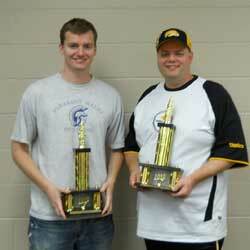 The open tournament was won jointly by Dr. Bob Keating of Cedar Rapids, IA and Kushan Tyagi of Ames, IA. Bob is a 2-time winner of the Golden Knights correspondence championship and Kushan is 22nd on the top 13 year old list and Iowa's latest expert. Comic Magician Lee Cole with the first pawn ever captured in a rated game. My longer tournament article can be seen at Iowachess.org which includes links to the games from the Open, pictures, and crosstables. 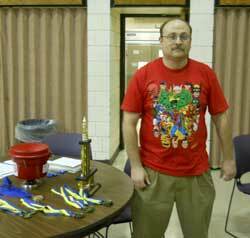 Organizer and Senior tournament director Hank Anzis with the U1400 prizes. Hank turned 50 the day before the tournament. 17 Chess fanatics came to the Boylston Chess Club in Somerville to play in the National Chess Day Tornado Event on October 9th. Marc "Catdog" Esserman won his first three games in typical attacking fashion and had a last round bye to take clear first $120. Three players tied for second: myself, NM Eric Godin and rising expert Mika Andrew Brattain, who has gained over 100 points since March!, winning $20 each of consolation money. Below is my third round draw with Godin. For standings, see the USCF MSA page. After this move, Eric had remembered we played back in January. In our previous encounter he played d5 and that game was draw as well. 13. d4 Qc7 14. Rxa4 Nh5 15. g3 Bf6 16.Ne3 Bg7 17. Ra2? Stronger was Bg5 forcing f6 weakening the a2-g8 diagonal and then playing 22. Be3. This throws much of White's advantage away... Better was Bg5 again. 23...Qxe7 24. h3 Be6 25.Bb3 Rfb8 26. Bd5 Bxd5 27. Qxd5 Nf6 28. Qd3? I missed d5... Better was Qc6 and the position remains equal. In a week that was capped off by record high temperatures in Southeast South Dakota, the kick-off chess event of the 2010-11 scholastic chess season, the 2010 Split Rock Scholastic was held in Garretson, South Dakota. This was the "hot" place to be for SD scholastic chess players celebrating National Chess Day. The 2010 Split Rock Scholastic Chess Tournament held at the Garretson School featured 91 scholastic chess players playing in four sections (K-3, K-5, K-8, and K-12), and one fire-breathing dragon playing his Dragon Variation in a section all to himself! The 3rd Annual Split Rock tournament was sponsored by the Sioux Empire Chess Foundation, and hosted by the Garretson Elementary School Chess Club. Grandmaster Alex Yermolinsky served as the Tournament Director, John Flores served as the Assistant Tournament Director, and Garretson ES Chess Club Coach Bob Boland assisted them and served as emcee for the event. Trophies were available to the top seven players in the K-3, K-5, and K-8 sections (team trophies to top five), and to the top five players in the K-12 section (team trophies to top three). Two new faces to the scholastic scene in SD were part of a foursome who garnered individual top honors in the four sections with their undefeated play. Third grader Joshua Lehman of Elk Point ES scored a perfect 5.0/5 in his first ever USCF-rated tournament in the K-3 section, and joining him in this honor was 9th grader Josiah Jorenby from Brookings (SD) Home School with his perfect 4.0/4 in the K-12 section. Both Lehman and Jorenby came into this year's tournament as untested & unrated, but one thing they don't leave as is unknown! Rounding out the top individual honors was 5th grader Ryan Fick of Garretson ES with his undefeated run through the K-5 section with his 5.0/5 score, and 7th grader Luke Rysavy, of O'Gorman Junior HS with his repeat performance of the 2009 Split Rock Scholastic as he again ran the table in the K-8 section with his perfect score of 5.0/5. Luke went on to win this game, and four others, for his second straight 1st place finish in the K-8 section of the Split Rock tourney. Rysavy is also the defending SD State Champion at the K-8 level as he enters another season of scholastic chess. In the team's portion of the annual Split Rock event, it was a sweep in the K-3, K-5, and K-8 sections, as teams from the Garretson School took top honors. It was the third time in the short history of the Split Rock that the Garretson ES team in the K-5 section took top honors, but the first time they were congratulated by a dragon!